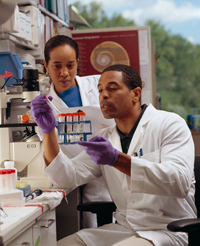 NCI makes available resources to academic discovery laboratories and not-for-profit organizations for pre-clinical development of drugs and biologics through its RAID program. RAID is designed to facilitate the translation of novel, scientifically meritorious therapeutic interventions originating in the academic community to the clinic. The goal of RAID is clinical “proof of principle” that a new molecule or approach is a viable candidate for expanded clinical evaluation, particularly in areas such as rare cancers, pediatric cancer, clinical/molecular pharmacodynamics, certain specified classes of biologics, natural products, and small molecule and antibody development for concomitant imaging studies. The output of RAID activities are products and information that will be made fully available to the originating investigator for support of an IND application and clinical trials. RAID proposals are accepted twice a year. Since its beginning in 1998, RAID has approved 104 projects out of the 288 proposals submitted. For more information on RAID, call 301-496-8720 or e-mail ncidtpraidinfo@mail.nih.gov. labs all over the world. Developed by the National Center for Biotechnology Information, PubChem is a component of NIH’s Molecular Libraries Roadmap Initiative, and it provides information on the biological activities of small molecules. PubChem is three databases — PubChem Substance (chemical substances screened for bioactivity), PubChem Compound (small molecule chemical structures), and PubChem BioAssay (bioactivity screens of chemical substances). Results of biological screening, links to published articles, and protein 3D structures are available. To access PubChem, visit http://pubchem.ncbi.nlm.nih.gov/. The PubChem Substances Database contains descriptions of chemical samples, from a variety of sources, and links to PubMed citations, protein 3D structures, and biological screening results that are available in PubChem BioAssay. If the contents of a chemical sample are known, the description includes links to PubChem Compound. The PubChem Compounds Database contains validated chemical depiction information provided to describe substances in PubChem Substance. Structures stored within PubChem Compounds are pre-clustered and cross-referenced by identity and similarity groups. Additionally, calculated properties and descriptors are available for searching and filtering of chemical structures. The PubChem BioAssay Database contains bioactivity screens of chemical substances described in PubChem Substance. It provides searchable descriptions of each bioassay, including descriptions of the conditions and readouts specific to that screening procedure. NCI’s Mouse Models of Human Cancer Consortium (MMHCC) Repository is an NCI-funded resource for mouse cancer models and associated strains. Comprised of 25 principal investigators, which connect more than 50 research institutions in the United States and abroad, MMHCC is a collaborative program designed to derive and characterize mouse models, to generate resources and information, and to use innovative approaches in pre-clinical trials and drug intervention studies. The repository makes strains available to all members of the scientific community (academic, non-profit, and commercial). MMHCC strains are maintained as live colonies or cryoarchived as frozen embryos, depending on demand. Up to three breeder pairs may be ordered from live colonies. Cryoarchived strains are supplied as frozen embryos or recovery of live mice by the MMHCC may be requested. A complete list of available strains can be found on the site. Researchers are encouraged to submit their cancer models to the MMHCC for archiving and distribution. Submission requests are reviewed and evaluated by the MMHCC Repository Committee. For more information on MMHCC, visit http://emice.nci.nih.gov/emice. NCI’s Developmental Therapeutics Program (DTP) maintains a repository of synthetic compounds and pure natural products that are available to investigators for non-clinical research purposes. Over 20,000 vialed samples and 3,500 plates are shipped from the Repository to external investigators throughout the world annually. Samples are available at no cost except for shipping charges. The Repository collection is a uniquely diverse set of more than 200,000 compounds that have been either submitted to DTP for biological evaluation or, in some cases, synthesized under DTP auspices. Importantly, investigators should note that chemical structures of these substances are those assigned by the originator of the material and in the vast majority of cases, the compounds have not been analyzed by DTP for accuracy of structure or for the purity of the sample. Compounds are available through a web-based ordering system. For more information on DTP’s resources, visit http://dtp.nci.nih.gov/guide.html. On September 1, 2009, the CRISP system was retired and replaced by the NIH RePORTER (Research Portfolio Online Reporting Tool Expenditures and Results). A beta version of the new RePORTER tool has been released to the public. This new tool retains all of the features of CRISP, while providing additional query fields, hit lists that can be sorted and downloaded to Excel, NIH funding for each project (expenditures), and the publications and patents that have acknowledged support from each project (results). RePORTER also provides links to PubMed Central, PubMed, and the US Patent & Trademark Office Patent Full Text and Image Database, for more information on research results. New features will be added to RePORTER in several releases throughout fiscal year 2010. In the meantime, comments on RePORTER are being solicited through the feedback link on the RePORTER site. To preview the new RePORTER tool, visit http://projectreporter.nih.gov/reporter.cfm.